Generals and diplomats are upset that Prime Minister David Cameron will not push for a vote on bombing Syria after failing to convince enough MPs it would have any beneficial effect on the war against Islamic State (formerly ISIS/ISIL). Cameron has shelved plans for a vote amid fears rebellious Tories would cancel out the few Labour MPs willing to back him. Had Cameron lost another vote on bombing Syria, after the embarrassing 2013 ballot when he was headed off by then-Labour leader Ed Miliband, the PM would have been politically compromised. Some fear that abandoning the vote has damaged UK-US relations. He told the Times that extending strikes into Syria would prevent ISIS fighters striking in Iraq before fleeing into Syria to avoid pursuit. 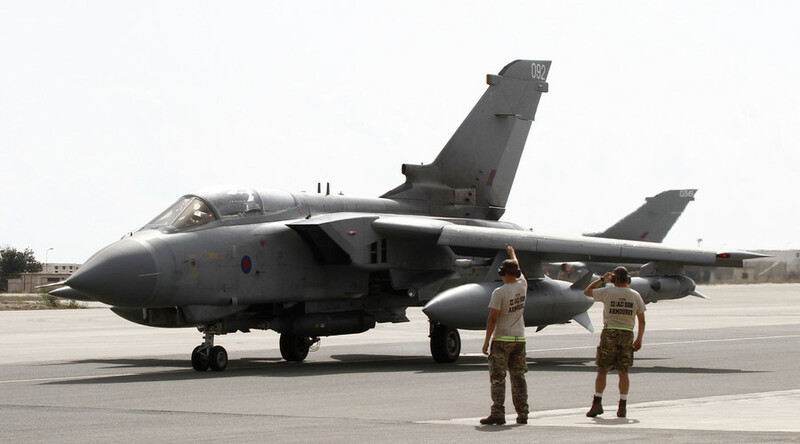 “If [RAF pilots] are given a moving target to deal with and those guys can cross the border into Syria and escape they must think it is crazy,” he said. Labour leader Jeremy Corbyn, a supporter of a political rather than a military solution in the region, said the UK should now also reconsider its airstrikes in Iraq. “I’m not sure how successful [military action in Iraq] has been because most of the action appears to have moved into Syria, so I think we have to look again at that decision,” he told ITV News. Despite claims to the contrary and official denials, it has been widely reported the UK is already involved in combat operations in Syria. Special Forces are being used to carry out operations against ISIS and to call in airstrikes, including those launched by armed Reaper drones such as the one that killed UK citizen Reyaad Khan in August. Khan’s death led to accusations the UK is operating a US-style ‘kill list’ to prioritize targets, including its own citizens.